I’m all about full-screen, intuitive, colorful interfaces to programs. I don’t really care if something has been done before (everything has been done before), unless you’re reinventing the reinventing of the reinventing of the wheel. Just give me a good interface and a decent perspective on the task at hand, and I don’t care if your program was written in 2012 or 1992 — it’ll work for me. Here’s stftp, which — with the possible omission of color — hits all three of those criteria. Among FTP clients, stftp is in a crowded box. But among full-screen console FTP client applications, it’s standing tall. The bottom line is a status bar. The top is a breadcrumb trail. Everything in between is selectable. Navigation is by arrow keys, with left and right moving you up or down in the tree. Press enter on a folder and you move in, but press enter on a file and you download it. Other one-letter keypresses are for uploading, deleting or filtering. My trusty memory script says stftp is running on a little over a megabyte of memory, which may or may not vary with the depth of your travels and the lists it needs to manage. Still, +/- 1Mb is a svelte number. 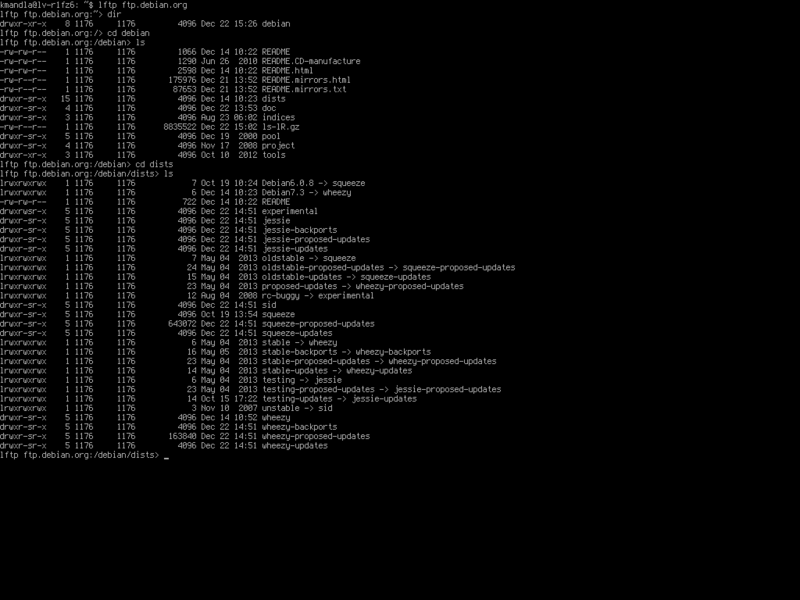 This entry was posted in Linux and tagged client, download, ftp, manager on 2014/10/13 by K.Mandla. My experiences with managing ftp servers is exceedingly thin. All the same, I do enjoy boasting about a bare-bones server I set up about eight years ago, using a busted-up 300Mhz laptop without a hard drive, a Xubuntu 6.10 live CD, a USB key and vsftpd. And with that sparse recipe, managed to transfer some files from my brother, who lived in another part of the world. Point being, I’m usually on the other end of the ftp adventure. I’m more experienced with clients than servers. lftp, ncftp, cmdftp, even plain ol’ ftp if need be. Servers just never enter my sphere. All the same, here’s pure-ftpd, in the best way I can show that it works. I can’t tell you what’s the best server system, and I’m not experienced enough to know what to look for anyway, so if you have a particular one you like, I suggest you stick with it. On the other hand, if you have a leftover 300Mhz laptop with no hard drive and a dusty Xubuntu 6.10 live CD, and maybe a USB drive to stash files on … well, why not give pure-ftpd a go? This entry was posted in Linux and tagged daemon, ftp, server on 2014/03/18 by K.Mandla. I’m going to give out one more bonus today, because fsniper may or may not be working, and because I’m getting close to the end of the F section. Here’s ftp, which you may know from experience, may know by reputation, or may not know. Any of the above are possible. 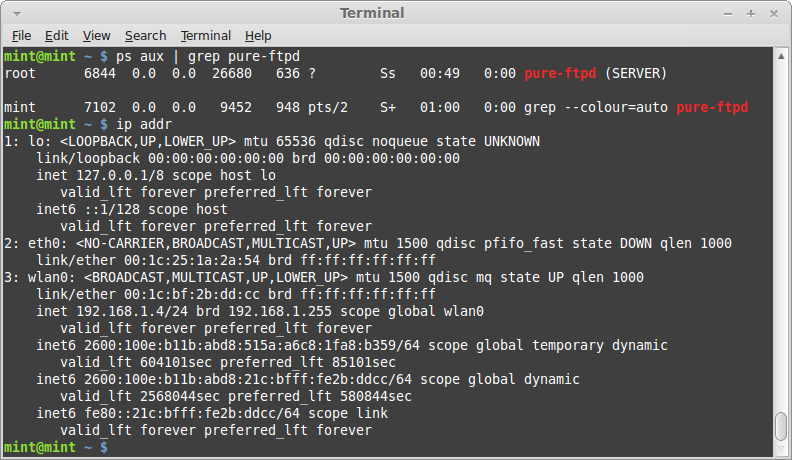 On my Arch system, ftp is part of inetutils, and shares company with some fine tools — like rcp, telnet and a few others. Debian keeps it in inetutils-ftp, so it’s apparently been broken out of the original set. That’s cool. ftp runs much like you might expect, if you were to type in all the commands that otherwise are handled by graphical clients like gFTP or FileZilla. 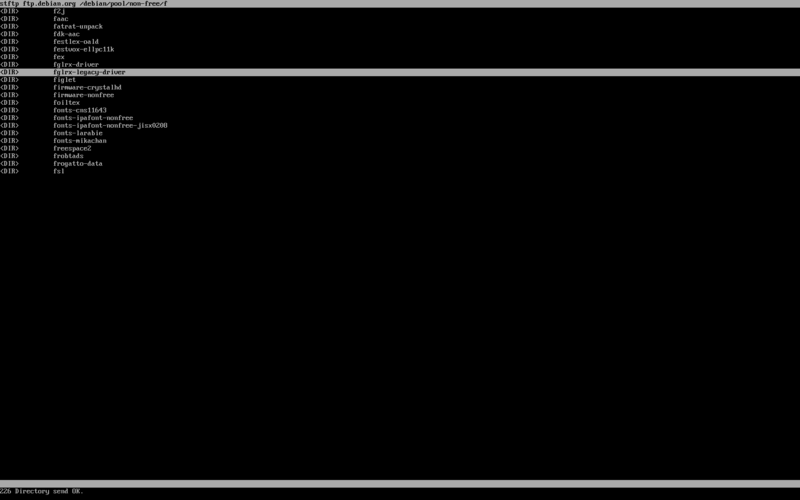 It’s not exactly a full-scale console application, like Midnight Commander is when it accesses FTP sites. But ftp is not much different than any other trapped terminal command-line application. It has a man page if you don’t know the protocol, and is fairly forgiving if you make a mistake. Yes, it’s a classic, but … no color, no fullscreen application … I know, I am easily disappointed. I try to be open-minded, I really do. This entry was posted in Linux and tagged client, download, file, ftp, manager, upload on 2013/11/08 by K.Mandla.